Clemson research shows that invasive plants, such as Japanese knotweed, can accelerate the greenhouse effect by releasing carbon stored in soil into the atmosphere. Clemson University scientists are shedding new light on how invasion by exotic plant species affects the ability of soil to store greenhouse gases. The research could have far-reaching implications for how we manage agricultural land and native ecosystems. In a paper published in the scientific journal New Phytologist, plant ecologist Nishanth Tharayil and graduate student Mioko Tamura show that invasive plants can accelerate the greenhouse effect by releasing carbon stored in soil into the atmosphere. Since soil stores more carbon than both the atmosphere and terrestrial vegetation combined, the repercussions for how we manage agricultural land and ecosystems to facilitate the storage of carbon could be dramatic. 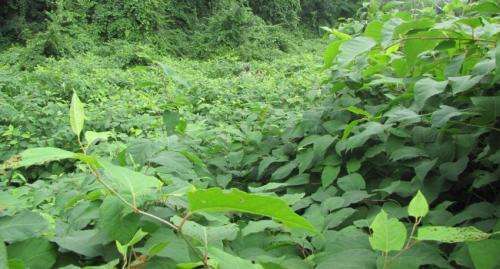 In their study, Tamura and Tharayil examined the impact of encroachment of Japanese knotweed and kudzu, two of North America's most widespread invasive plants, on the soil carbon storage in native ecosystems. They found that kudzu invasion released carbon that was stored in native soils, while the carbon amassed in soils invaded by knotweed is more prone to oxidation and is subsequently lost to the atmosphere. The key seems to be how plant litter chemistry regulates the soil biological activity that facilitates the buildup, composition and stability of carbon-trapping organic matter in soil. This layer of decomposing knotweed will eventually form soil organic matter in invaded ecosystems. "Our findings highlight the capacity of invasive plants to effect climate change by destabilizing the carbon pool in soil and shows that invasive plants can have profound influence on our understanding to manage land in a way that mitigates carbon emissions," Tharayil said. Tharayil estimates that kudzu invasion results in the release of 4.8 metric tons of carbon annually, equal to the amount of carbon stored in 11.8 million acres of U.S. forest. This is the same amount of carbon emitted annually by consuming 540 million gallons of gasoline or burning 5.1 billion pounds of coal. 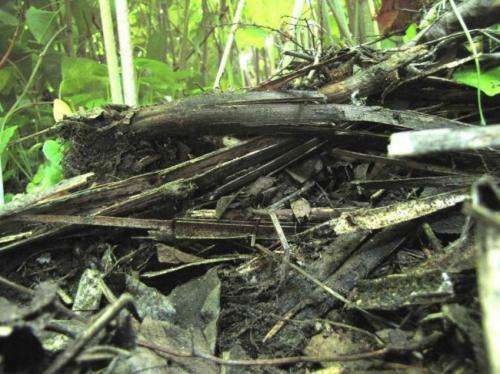 "Climate change is causing massive range expansion of many exotic and invasive plant species. As the climate warms, kudzu will continue to invade northern ecosystems, and its impact on carbon emissions will grow," Tharayil said. The findings provide particular insight into agricultural land-management strategies and suggest that it is the chemistry of plant biomass added to soil rather than the total amount of biomass that has the greatest influence on the ability of soil to harbor stable carbon. "Our study indicates that incorporating legumes such as beans, peas, soybeans, peanuts and lentils that have a higher proportion of nitrogen in its biomass can accelerate the storage of carbon in soils," Tharayil said. Thrarayil's lab is following up this research to gain a deeper understanding of soil carbon storage and invasion. Tharayil leads a laboratory and research team at Clemson that studies how the chemical and biological interactions that take place in the plant-soil interface shape plant communities. He is also the director of Clemson's Multi-User Analytical Laboratory, which provides researchers with access to highly specialized laboratory instruments. This article makes little sense to me unless the effect is a result of attempts to eradicate the kudzu by bulldozing or tearing it out where it is found. Otherwise, it grows just as other plants do and as long as the sequestered carbon in the soil (in the form of humus or decaying organic matter, for example) is undisturbed by eradication attempts, it should not be lost to the air in much greater amounts than in land covered by other plants besides kudzu. I'd venture to estimate that more carbon has been lost from the muck soils around Lake Okeechobee in Florida due to sugar cane cultivation that will ever be lost by kudzu growing around! Those muck soils were once part of wetlands and the carbon protected from oxidation. Ever since that muck has been exposed to the air, it has been disappearing rapidly for years now. My guess is we will see all that muck completely gone long before kudzu has the imagined harmful effects estimated in this article. @LariAnn... i think this sentence from the article might help you. "The key seems to be how plant litter chemistry regulates the soil biological activity that facilitates the buildup, composition and stability of carbon-trapping organic matter in soil." If I remember correctly from reading about FACE research that vines like kudzu are the ones that benefit most from increase co2 levels. kudzu can't be stopped using conventional methods. Sure! Now the faux warmists are planning genocide against kudzu... What's next? "During the Great Depression, the new Soil Conservation Service promoted kudzu to stop this type of erosion." "As devastating as kudzu can be, it also has benefits—in certain places. "It will grow in poor-quality soils," Moorhead says, which is why it was planted so widely in the South in the thirties and forties. "Look at some of the early plantings on highly eroded sites, at how much leaf area gets recycled every year as a mulch. It's part of the soil-building process." Moorhead clicks an image on his monitor, an aerial shot of a Mississippi infestation. A green carpet of kudzu covers a dozen or so roadside acres. Afternoon shadows reveal the deep, veinlike pattern of a vast gathering watershed, a baby Providence Canyon, perhaps, that once threatened to wash away the land until kudzu came in to stop it. "In some places," Moorhead observes, "kudzu is literally the only thing holding the world together."